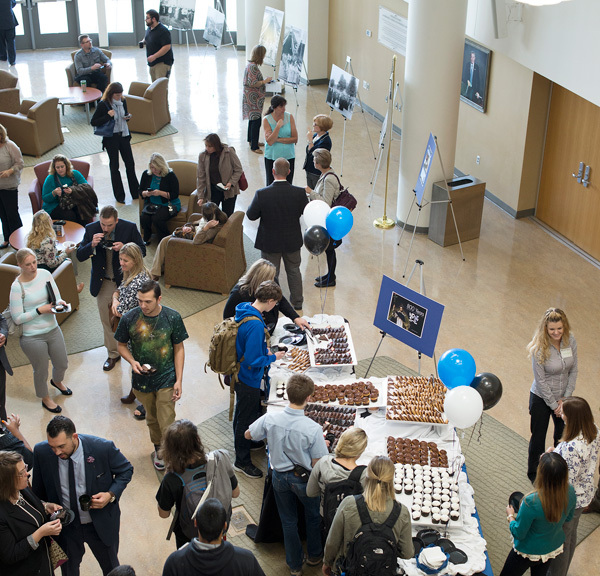 Students and faculty enjoy Mount Saint Mary College’s Founders Day reception on Wednesday, October 7, 2015. Photo by Lee Ferris. Mount Saint Mary College, Newburgh, New York, celebrated the legacy of St. Dominic de Guzman and the Dominican Sisters who founded the college with the annual Founders Day reception on Oct. 7. “We remember with gratefulness the founding of the college by the Dominican Sisters of Hope, formerly known as the Dominican Sisters of Newburgh,” said Fr. Francis Amodio, O.Carm, campus chaplain and director of Campus Ministry. The college’s Guzman Hall, a freshman residence, is named after St. Dominic de Guzman. Before it was sold to the college in the late 1980s, Guzman Hall was a convent for the sisters as they studied before they were sent to various missions to serve the Church. In 2016, the Dominican Order throughout the world will celebrate their 800 year Jubilee. The reception was sponsored by the Mount’s Catholic and Dominican Institute. Directed by Charles Zola, assistant professor of philosophy, the institute promotes the college’s heritage of St. Dominic; advances the Dominican charism of study and service; provides a forum for discussion of contemporary ethical issues; and enhances Catholic and Jewish dialogue. Guided by the Mount’s vision and mission statement, the institute welcomes persons of varied faiths and acknowledges different religious traditions as essential to the college’s intellectual and spiritual life.